At SQLPASS 2015 I attended a presentation by Kendal Van Dyke, in which he told us that it was possible to log the actions of Replication to an output file. This was news to me, so I just had to have a closer look. This will use the same Publication that I created in my earlier articles (Subscription and Distributor), which has been running on my test instances ever since. 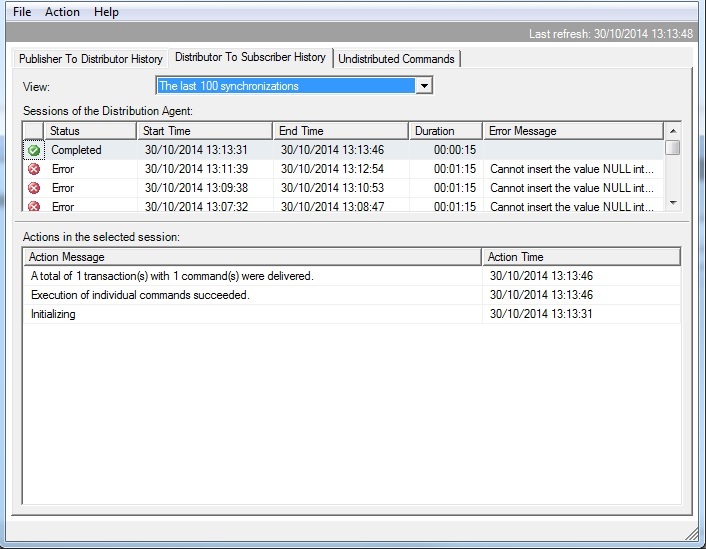 Replication is controlled via Agent Jobs and this is where the output commands are used. 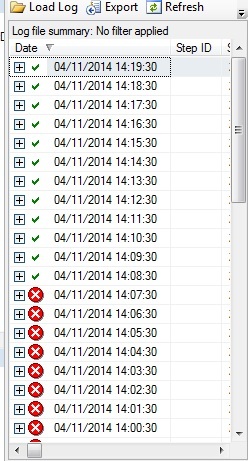 Every job involved in Replication (Log Reader, Queue Reader and Distributor) can make use of them. -Output [Filename] is the name of the text file that the output will be written to. If the file does not exist then it will be created, otherwise it will be appended to. -OutputVerboseLevel [0|1|2] is the level of output required, with 0 being the lowest and 2 the highest. Implementing this is quite easy – located the Agent jobs for the Publication of interest and add the commands to end of the job’s command line. 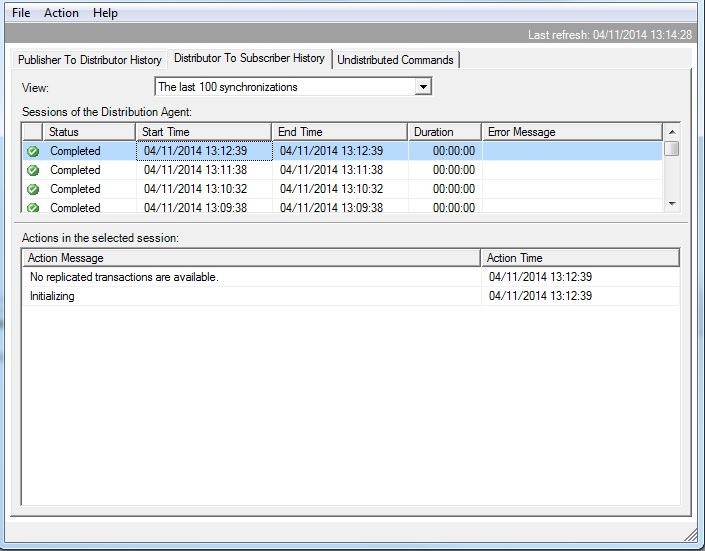 The appropriate Log Reader Agent and Queue Reader Agent can be found via the Replication Monitor. Open Replication Monitor, from any of the Publisher, Distributor or Subscriber servers and locate the ‘Agents’ tab from the appropriate Publication. From the ‘Agent types’ drop-down select either ‘Log Reader Agent’ or ‘Queue Reader Agent’, then right-click on the entry and select ‘Properties’. This will show the same control that selecting the job under SSMS ‘SQL Server Agent/Jobs’ and ‘Properties’ of the appropriate Job would have shown, but removes any doubt you have located the correct Log Reader Agent. Of course, if you know the job involved then you can just locate each from the SSMS ‘SQL Server Agent/Jobs’ list on the appropriate servers and update them directly. In my Pull Subscription I have to locate the Distributor Job myself within SSMS – it doesn’t appear as an option via Replication Monitor. Once the parameters have been added the jobs need to be stopped and started again, so the new command-line can be read. With OutputVerboseLevel set to 0 only basic details are written to the text files – various settings of the publication, server names, job names and suchlike. The Distributor produces these details every time it runs, so even this can mean quite a large document given enough time. This is useful for getting error messages with basic history details. OutputVerboseLevel of 1 also shows statistics, in addition to connection details and other information. This of course increase the output from any job using this setting. OutputVerboseLevel of 2 is the most detailed level of output. This shows the stored procedure calls, batch details, connections, disconnections and so on. It is very useful for a short period of time but quickly fills drive space. Use this when you need a great deal of detail for a short period of time. In the previous article I covered how to use the Replication Monitor to see what is happening with a Publication and to find out what the errors are. However, in some circumstances Replication Monitor may not show the entire picture with regard to the health of a Publication. Information can also be gleaned from the jobs that actually perform the tasks that make the Publication work. 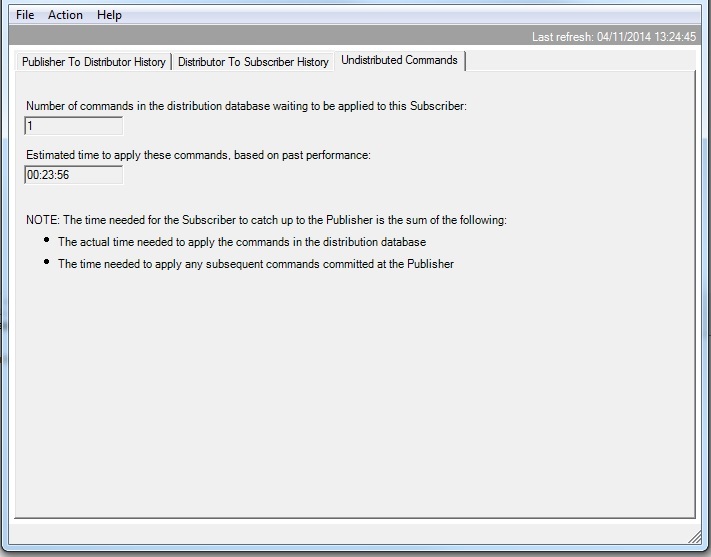 In this example I have removed the login of the Subscriber from the Distributor with a simple DROP LOGIN command. However, this has been sitting here for several minutes now and the history has not moved – stuck at the last transaction that completed at 13:12:29. There is also no error message displayed, so this screen indicates that there must be a problem (because I know it should run every minute) but gives no details. From the Tracer Token we can see that the Publisher to Distributor connection must be working and there is no response between the Distributor and Subscriber. Most issues with Replication are detailed in either the Replication Monitor or in the history of the jobs used to run the Replication tasks. The following examples are based upon the Pull Subscription detailed in earlier articles. This tool is available to anyone who is a member of the sysadmin role or replmonitor role. It is loaded from any SQL Server instance that has Replication enabled, although life is easier if you launch it from the Publisher or Distributor (anywhere else and you may have to configure it to look for the correct servers). In the screenshot above the tree structure in the left window has been expanded. The highest level is the Distibutor, expand that and beneath it is the Publisher and beneath that is the actual Publication. Select the Distributor and three tabs are available in the right-hand pane – ‘Publications’, ‘Subscription Watch List’ and ‘Agents’. Publications shows the Publications that this Distributor is responsible for, providing the Publisher name, Publications name, the number of Subscriptions and basic performance data. Agents shows the various Agents that can be involved in Replication. In this Publication select ‘Merge Agent’ will show nothing, because it isn’t a Merge Publication and selecting ‘Snapshot Agent’ will show a status of ‘Never Started’ because snapshots are not used with Publication. Other selections will show the status of various Agents and jobs connected to this Distributor. There are three tabs in this control and the most important of these tends to be the ‘Distributor To Subscriber History’ tab. As a default it shows the last 100 synchronisations (in this Publication there is one synchronisation every minute) but can be changed by using the drop-down at the top of that tab. To show what should normally happen with this tab clear the Subscriber table, generate 1000 rows of data within the Publisher and watch this screen as the data is Published across. 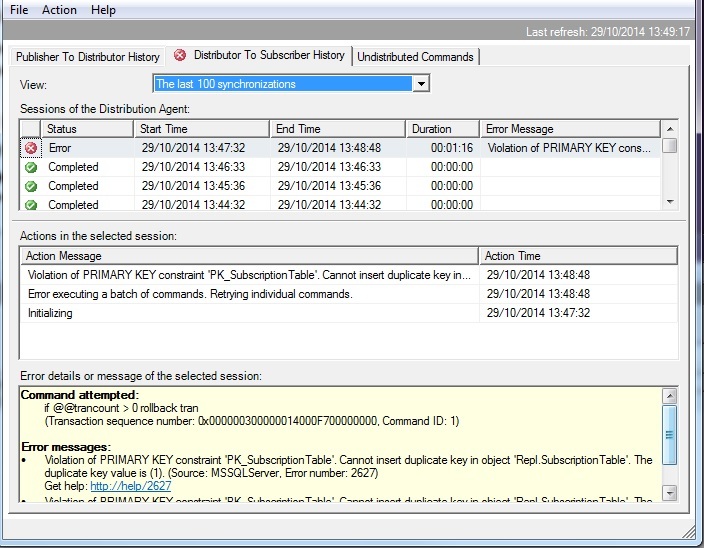 Now repeat the insertion on the Publisher, having truncated the table on the Publisher first it will generate Primary Keys that already exist on the Subscriber. This of course, will not go down well when the data gets to the Subscriber. 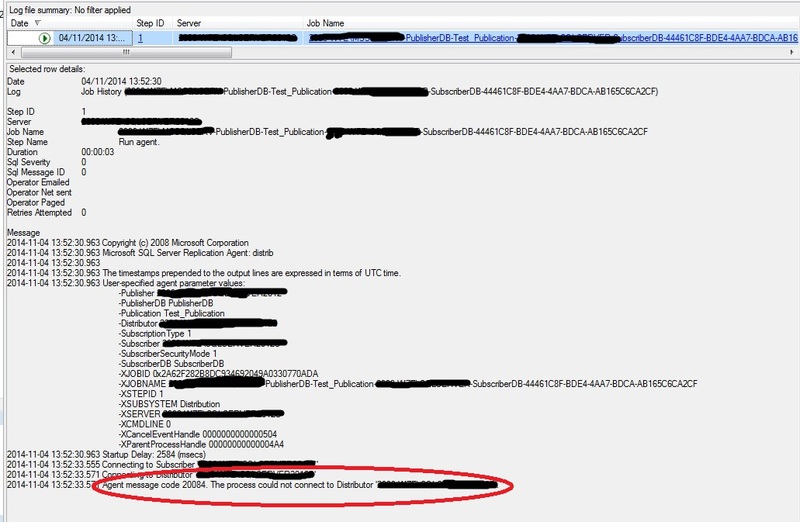 Another way to use this tool for locating the problem is in the Error Details part of the screen, with the Transaction Number displayed. 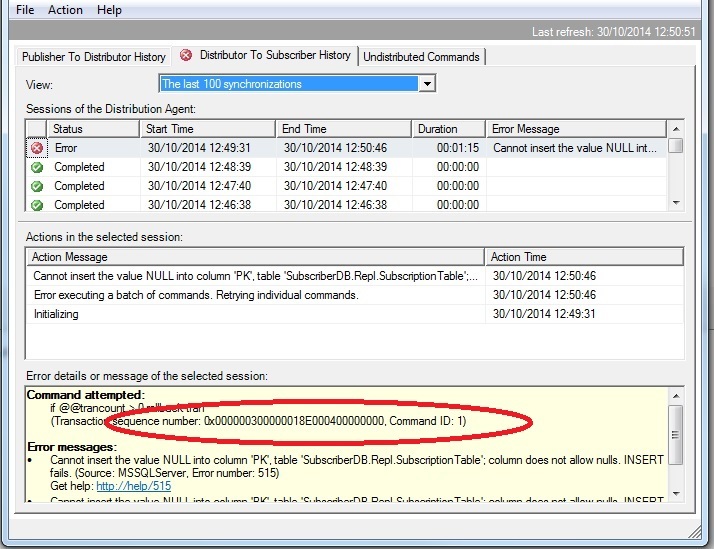 To show what can happen if the customised Stored Procedure is wrong, within the Subscriber change the SP ‘dbo.sp_MSins_Repl_SubscriptionTable’ to remove reference to th ‘PK’ column, which is NOT NULL. Of course, any attempt to write a row to this table via this SP now will result in an error. The trick is to work out what command is failing within replication. If multiple rows are returned from this query then the required row is the one where ‘command_id’ matches ‘Command ID’ shown in the error message from Replication Monitor (although you should check the column ‘partial_command’, as the query might be split across several rows). From the column ‘command’ we can see the call to ‘sp_MSins_Repl_SubscriptionTable’ along with the parameters used. Now we have the command that is causing the issue and the parameters it is using. In this case it’s obviously a fault within the SP, so simply amend it back to save the PK column and all returns to normal. Another basic way to check Replication is all connected up is to run a Tracer Token through it. A Tracer Token is just a small amount of data written to the log of the Publisher and then tracked through the Publication. To run a Tracer Token through Replication Monitor go to the bottom of the tree structure in the left-hand window, selecting the Publication. Three tabs appear and one of these is ‘Tracer Tokens’. Select that tab and press the button ‘Insert tracer’. The time for ‘Publisher to Distributor’ will generally be within a few second, as that part of the Publication is configured to run constantly. ‘Distributor to Subscriber’ can take a while, depending upon when that job is scheduled. In this Publication it is once every minute, so could take anywhere up to one minute to complete. Once completed it shows the total latency and is an indication that the connections are configured correctly for the three main elements (Publisher, Distributor and Subscriber) to communicate correctly.